You may have wondered how they water the vegetables on the Public Farm 1 at P.S.1. The plants are installed in what the manufacturer calls “smart pots”. This is a bit of horticultural hype considering that the “smart” relates only to a quality of the fabric used to make the bag (not really a pot). Without going into the horticultural nitty-gritty, the fabric prevents roots from growing in a circular pattern and girdling the tree. These are really meant as tree planters you see. The benefit of these bags at Public Farm 1 is they provided a means of offsite growing and ease of transport to the site. They really have no other specific value in this project since these are one-season vegetables, not trees. You can see in the top photo that there is an ordinary drip system installed. Collected rainwater is fed to the plants this way. There are more photos of the planters here. I understand why the architects and consultants used the system they did. 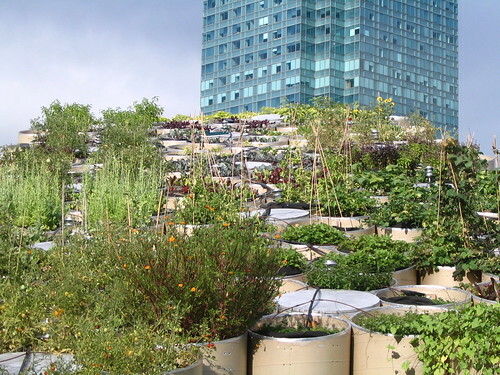 The shortfall is that it is not relevant to urbanites interested in growing vegetables in the city. Urbanites are not likely to use these so-called “smart pots”. They just aren’t practical for city patios, pavements, balconies and rooftops. From a public education viewpoint, it would have been better to sub-irrigate these vegetables as is done in EarthBoxes and home made sub-irrigated grow boxes. This method is perfect for urban agriculture on a small one-box scale to gardens with many boxes. Using sub-irrigated planting, Public Farm 1 would be a leading edge demonstration garden of 21st century urban vegetable growing on a very personal level.